I finished this on Saturday as part of the 48 Hour Book Challenge. I’d read about it originally on Charlotte’s Library, and then saw it again on a list of What to Read Next: Percy Jackson from Fat Girl Reading shortly after I’d posted my own list of Rick Riordan Read Alikes. That reminded me that I really should read it! The Savage Fortress by Sarwat Chadda. Arthur A. Levine, 2012. 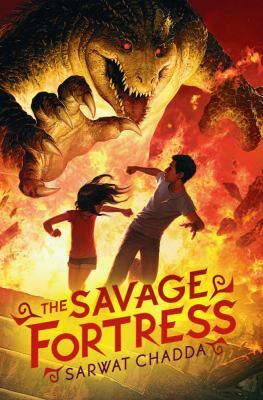 The Savage Fortress tell the story of Ash Mistry and his little sister, Lucky, who are spending the summer visiting their uncle back in India. Their parents came from India, but they’ve grown up in London, and the heat and crowds of India are strange to them. Ash has grown up loving Indian mythology, though, so when his uncle is invited to help with some research around a civilization that vanished from India 4000 years before, he’s thrilled. Then (very early on), he accidentally finds himself in the study of Lord Savage. There he finds lots of creepy things, including scrolls written on human skin, and overhears Lord Savage calling his servants (all of them wearing sunglasses at night) rakshasa – demon. Then, on a trip to the dig, Ash finds a buried statue of the legendary hero Rama, shooting an arrow with a gold tip. That tip falls off into Ash’s hand – and before he knows what’s going on, he and Lucky are being pursued through the streets of Varanasi by horrible demons. It’s soon clear that Lord Savage is trying to resurrect the horrible demon king Ravana whom Rama defeated thousands of years ago. Can Ash stop him before it’s too late??? This is a high action book with plenty of gore and exciting chase scenes. It’s a good introduction to Indian mythology which should be lots of fun for mythology fans. Ash does a little bit of reflection on his heritage – in London, he’s definitely considered Indian, but in India, he’s a “coconut”, brown on the outside, white on the inside. There’s a tiny bit of romance and some thought about that – but Ash is only 13, and it’s really just a tiny bit of romance. The villain is purely villainous, and our hero is never going to be anything else. 10-year-old Lucky, unfortunately, never gets to develop much beyond someone for Ash to save, but the Wise Old Guru’s demon assistant lady is much more active and very entertaining. But this is not trying to be a character-driven book. It’s all action and setting, quite fun if not my usual choice. It definitely belongs in the hands of Rick Riordan fans. This entry was posted in Books and tagged 48 hour book challenge, diversity, India, multiculturalism, mythology, teen fantasy. Bookmark the permalink.